Talk to any grocer or convenience store proprietor and they’ll all tell you that refrigerated display cases are some of the most important pieces of equipment for business. Why? Because they display food in a way that’s neat, organized and appealing to shoppers. Non-refrigerated display cases can do the same thing for the rest of your product, especially baked goods, ensuring that they fly off the shelves in the same way that your refrigerated products do. 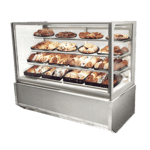 A non-refrigerated glass display case from CKitchen will help you beautifully display non-refrigerated food in your bakery, coffee shop, convenience store or deli. Why use display cases? Non-refrigerated cabinets help keep food safe from dust, dirt, debris, moisture and excess air, ensuring that they look and taste fresh when they reach the consumer. We have a huge selection of unique dry display cases by commercial food service leaders like Federal Industries, Piper Products and Turbo Air. 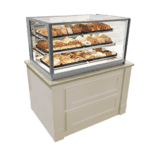 Options range from a small, countertop self-serve bakery display case ideal for convenience store donuts and pastries to large-scale counter-style bakery cases that allow you display large quantities of freshly baked breads, cakes, cupcakes, cookies and pastries. Because we offer styles by the top makers in the industry, you can expect these bakery cabinets to include some of the best features. Find styles with built-in lights, self-closing doors, tissue dispensers, adjustable shelves and much more. Most styles are UL listed for safety and sanitation, so you know they’re safe for any food service environment. CKitchen also specializes in refrigerated display cases. It doesn’t matter if you’re looking for a reliable refrigerated pastry case or a countertop dry display for your checkout counter, you’ll find just what you’re after here, with top-notch customer service and financing available.